Figuring the correct pipe size for your compressed air distribution system is an important task. Pipe that is sized too small can create big pressure losses and reduce operating efficiency. Replacing piping is costly. On average, 70% of a contracted piping job goes for labor and 30% for materials. Do you know the biggest mistakes made in figuring compressed air piping sizes? Many people who plan the piping never consider the fittings or the future. Every pipe fitting creates a certain amount of increased frictional air loss that is equal to a specified length of pipe. For every 100 feet of pipe you will have a ONE POUND PRESSURE DROP caused by frictional air loss. Any turns in the pipe at fittings, ells, tees, and valves increase pressure drops even more. That’s why the EQUIVALENT LENGTH OF PIPE (FT.) for PIPE FITTINGS chart was developed to help you determine the best pipe size for your system. Are you planning to add more equipment in the next year or two? Then plan for larger piping now. Since the material costs in piping are low compared to installation or replacement cost, it’s wise to select pipe of an adequate size. If there is any doubt that a pipe size may create a pressure drop, use the next largest size. Remember that an oversize pipe compensates for possible scale build-up and provides for future expansion of the overall air system. Determine your air compressor’s maximum CFM. Draw a piping schematic and show all pipe fittings, valves, etc. Measure and write the corresponding lengths of pipe on your schematic, then total the length of all straight pipes needed and note that on your schematic. and then go to the right until you see the column header with nearest length in feet to your total pipe length. 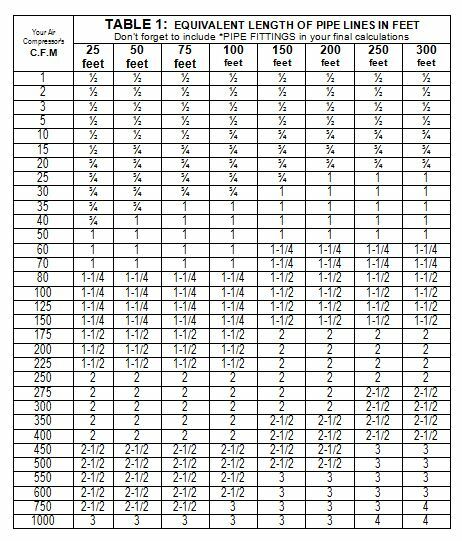 Find where the CFM & PIPE LENGTH intersect on the chart and it will show the recommended pipe size for that length. Take that pipe size to TABLE 2 and use the table to find all the EQUIVELENT LENGTHS OF PIPE needed for each PIPE FITTING. Write these lengths on your piping schematic at each fitting. TOTAL all the EQUIVELENT LENGTHS OF PIPE needed for each PIPE FITTING and add to your total of straight length of pipe. This will give you a new and more accurate total pipe length needed. Take your new total of EQUIVELENT LENGTH OF PIPE IN FEET back to TABLE 1 and use this number to determine the PIPE SIZE you need. Now is the time to plan for larger piping that may needed for additional future equipment.